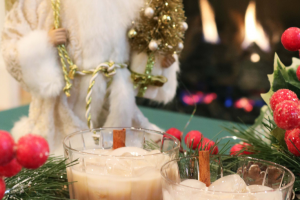 Turtle Doves cocktail is a fantastic holiday party drink. Full of flavors of vanilla, amaretto and a hint of nutty for an overall delicious Christmas drink! …and a partridge in a pear tree! You can’t tell me you didn’t sing it too! 🙂 Heading into a new day of Christmas drinks and it wouldn’t in true Christmas spirit without some Christmas party drinks named after Christmas songs. Christmas music is in full swing over here! I just wish I’d get it together for Christmas gifts. (Anyone else a procrastinator?) I am always early for sending out Christmas cards but last minute for everything else! Just like this post…. I really should have posted this on the second day of Christmas, ( Epic Fail!) Oh well! I really enjoyed experimenting with this cocktail recipe. The first try, my entourage was underwhelmed and felt like it was lacking something. This was true, it needed more flavor. With a little more experiementation and will power, I came up with this holiday recipe. This version of the holiday cocktail was voted by my “entourage” as the best! The eggnog just gave the drink a great flavor. I’ve come to love frangelico, with its nutty flavor and I’m sure you can already tell my admiration for vanilla vodka. 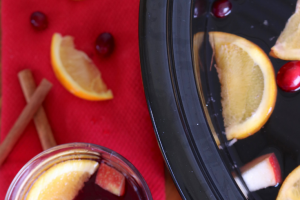 It does shockingly well in many Christmas party drinks. It’s not too overpowering but provides a great taste to the overall drink. Although it’s not my favorite on the 25 days of Christmas drinks, it still is pretty tasty. In a shaker with ice, add all ingredients together and shake vigorously. Pour into fancy glass and top with whip cream and/or nutmeg. If you’re just tuning in, this is day 3 on the 25 drinks of Christmas! 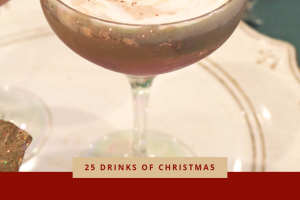 Be sure to check out the other holiday cocktails that made the list!